Copyright © 2015 SpiritWings Humane Education Inc.
First published 2015 by SpiritWings Humane Education Inc. Animal welfare—Moral and ethical aspects. Wulff, Gypsy (Gypsy Carmen), 1955- editor. Chambers, Frances (Frances Mary), 1952- editor. Cover design by Marion Duke. Cover photo by Ariane Timmermans – Suraj and rescued calf at Animal Aid Unlimited, India. Turning Points in Compassion is a wonderful reference book about the lives of animal rights and vegan leaders from all over the world, who tell about their conversion from living in the animal exploiting world, to becoming animal and vegan advocates. In Turning Points in Compassion we visit with former farmers, doctors, people who operate rescue organizations and sanctuaries, cooks and dietitians, people who are involved in politics and new ways of thinking about ending the suffering of animals, lawyers, people involved in spiritual awakening and religion, and how the world is changing. For anyone who is struggling with the horrible treatment of animals who are exploited by our fellow human beings, and wanting to end their eating and wearing of animals, Turning Points in Compassion should be very inspirational, for they should be able to relate to others who have had the same struggle. Gypsy Wulff and Frances Chambers did an excellent job in acquiring these stories and editing Turning Points in Compassion. 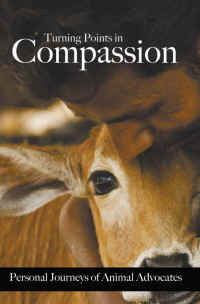 We highly recommend Turning Points in Compassion to everyone; it is an excellent reference book for every library. 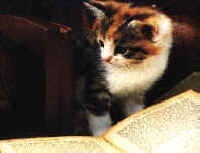 All proceeds from the sales of the book go to animal rescue.